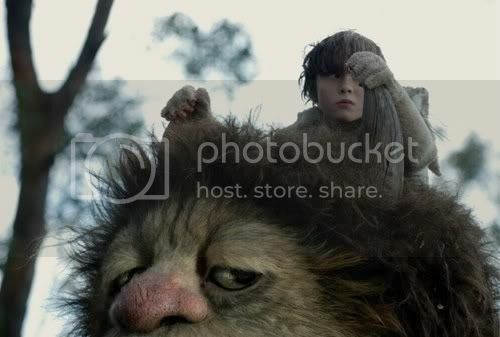 Io9 has posted a bunch of stills from Where the Wild Things Are. Holy freakin' cow this better be brilliant....and holy freakin' cow, it looks like it is. I am very excited for this movie. I saw a trailer clip with Maurice Sendak giving his blessing over the film and that made me feel a LOT better about it. AWesome! I can't wait to see this! I've always loved this book. P.S. The art book Guild Wars 2 is now available for purchase. I just ordered mine and was able to use either a credit card or PayPal. I really liked your blog! Please come visit my site Anchorage City Directory when you got time. I think it looks like an amazingly beautiful and exciting adventure that will please children and adults alike. Though it make take us places that Maurice Sendak didn't in his book, I think the spirit of the book is there. I'm really looking forward to seeing it. Thanks for the post. With Spike Jonze @ the helme it will be properly done with the utmost of respect with very creative artsy touches through out.. . Spike is an extremely creative artist & visionary that probably like Myself & all of you a special fondness for the book growing up.. . No ONE will do a better job with this subject then Spike. Period. You have no concerns. I've known Spikes work since his skateboarding days before even video production for Weezer, so I kinda know his work & feel confident about his artistry & integrity... . he's a true artisan.